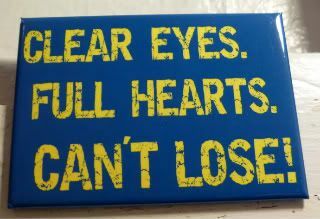 Magnet #1159 - Clear Eyes. Full Hearts. Can't Lose! Been holding on to this magnet for a while now, waiting for the inevitable bitter end. And, much as I was loathe to, I ended up finishing up the last four episodes of Friday Night Lights today on the train. I'm so very, very sad that it's over. Let's face it though - when the show first started five years ago, no one thought it was gonna last. Sure, critics loved it, fans loved it, but no one thought it was gonna come back. So technically, each season has been such a wonderful gift, we can't really be greedy, methinks. Still. I will miss this show ever so much. Anyway, since the woman beside me here on this train didn't realize I was watching the very. last. episode. ever. and was subsequently spoiled (like crazy), I'm feeling especially sensitive to not loading this post up with any spoilers. So I won't. But, here's what I will say that IS spoilery. Stop reading now if you DO NOT WANT to be spoiled. I mean it. I'm warning you. I didn't think it was possible for Kyle Chandler to look hotter than when he wore his Dillon Panthers Blue golf shirt and hat out on the field. He was so darned pretty in that color. Then he donned the East Dillon Lions Red and Black. And he was even hotter in black that golf shirt out on the field. And by goodness, ya'll, I honestly didn't think he could get hotter. Until he put on that Pioneer Green. Holy freakin' cow does that green bring out the color in his eyes.